Who is hiding behind the mask in The Astonishment of the Mask Wouse? In 1889, James Ensor painted The Astonishment of the Mask Wouse, one of the top works of the Ostend Master, which has been in the possession of the Royal Museum of Fine Arts Antwerp since 1926. (1) The work presents a masked, dolled-up old woman in an enchanted room. She is portrayed at full-length and in profile. She is wearing a bonnet with a cashmere stole slung over her shoulders. She has a drip-nose. Her demeanor suggests that she has just stepped into the room. She holds a ridiculous parasol fast in her left hand over her shoulder while, leading from her right hand, she seems to ask what is going on in the bewitched room. At her feet, on the plank floor, lies a collection of sundry items displayed: a violin, a clarinet, masks, an empty bottle, a fan, a top hat and patchwork. Just before she walked into the room there was a masquerade in progress. The music and the noise have maybe enticed her to the room. When she entered the room, the masks fell ‘lifeless' into each other. Other masks, amongst which are carnival masks and Japanese and/or Chinese stage masks, stare out aghast from all nooks and crannies of the room at the Mask Wouse, whom abruptly interrupted their festivities with her unannounced appearance. Regarding the identity of the old woman, there appears to be no doubt. The title of the painting is clear: the portrayed woman is the Mask Wouse. However, does this concern a living woman who sports a mask? Or, does it rather mean a carnival mask that leads its own life? Just as in many other works by Ensor, we are confronted with this Ensorian paradox. In English, ‘Wouse' means: ‘Significant other; partner in a committed romantic relationship or marriage'. (3) In his two-part novel, Joseph Andrews, the British satirist Henry Fielding (1707-1754) used the word ‘wouse' for the namesake of the two novel characters Mr. and Mrs. Tow-wouse. (4) Mrs. Tow-wouse is depicted in various chapters of the first part of the novel as a heartless and unscrupulous shrew, who terrorises her husband and her environs. The question naturally remains unanswered as to whether James Ensor read the novel; and, if so, whether he was inspired by Fielding's character. On another note, it is most likely that he provided the name Wouse once the painting was already completed. One is naturally inclined to recognise the caricature portrait of Ensor's mother or grandmother in the figure of Wouse. In various works he has caricatured his mother, aunt or grandmother. (5) We also know that the marriage of Ensor's parents was far from happy and that Ensor's mother must have been an authoritative woman. Frustrated and unhappy, Ensor's father frequently fled the parental homestead to seek solace in drink in one of the Ostend fisherman quarters. He died on 14 April 1887 at the age of 52 after he spent the day--on Ensor's birthday--in a state of drunkenness and was found in one of the streets of Ostend and brought home by the police. The cause of his death has never been clarified. Ensor inherited a richly-filled library from his father with the most diverse publications, in which the artist regularly found inspiration. It is not unthinkable that a copy of Fielding's novel was to be found therein. Or, was Ensor maybe made aware by his friend Eugène Demolder (1862-1919) of the satirical novel of Fielding, who just like Demolder, was a writer and justice of the peace? Throughout his career, Ensor was often influenced by artists who shifted the boundaries of expressive decorum. For example, his interest was piqued by British (Cruikshank, Rowlandson and Gillray) and French (Grandville, Doré and Daumier) political satire. (6) The old, masked woman in his The Astonishment of the Mask Wouse could be inspired by the travesty in Mr. Royer Colas en vieille marquise de l'ancienne cour, a lithograph by Honoré Daumier, published in Le Charivari. (24 January 1833) (7) Ensor's etching, The Temptation of Christ, appears to be influenced by Daumier's lithograph Le Tentateur, published in Le Charivari (29 September 1851). (8) Ensor was not only influenced by carnival masks that were for sale in his parents' shop, but also by the caricature heads such as in Daumier's lithograph, Masques de 1831, published in La Caricature (8 March 1832). 3. See Urban Dictionary (Internet). 4. The History of the Adventure of Joseph Andrews, and of his Friend Mr. Abraham Adams, written in Imitation of the Manner of Cervantes, Author of Don Quixote, London, A. Millar, 1742. 5. Cf. in Figure revêche (Surly Countenance) from 1890 (Tricot 312). 6. With regards to the influence of foreign caricatures, see the exhibition catalogue Art graphique d'Ensor en confrontation, Museum of Fine Arts, Ostend, 1999-2000; Xavier Tricot, ‘Ensor and English art', in exhibition catalogue James Ensor. Theatre of Masks, Barbican Art Gallery, London, 1997, pp. 100-117. 7. Pierre Paul Royer-Collard (1763-1845) was a professor of history and mathematics, as well as a lawyer and delegate. He taught at the Sorbonne and became a member of the Académie Française in 1827. During his tenure as delegate between 1815 and 1844, he established new laws with respect to the press. He was a liberal Monarchist and retained his function as delegate until 1844. 8. Robert Hoozee, Sabine Bown-Taevernier, J. F. Heijbroek, James Ensor. Dessins et estampes, Antwerp, Mercatorfonds, 1987, 214 pages (illustrated). See also the drawings Ensor made between 1880 and 1886 after Daumier's lithographs: Exhibition Cat. 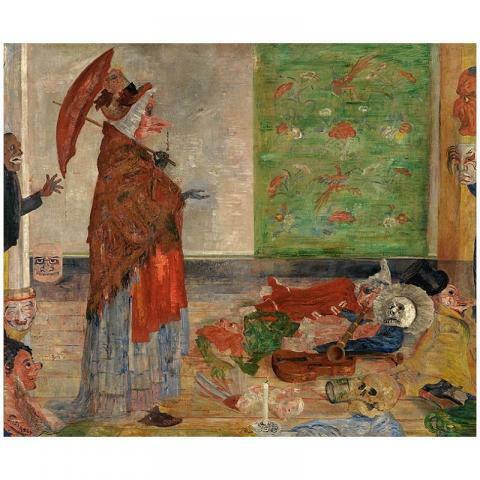 James Ensor. Universum van een fantast, Gemeentemuseum, The Hague, 2011, pp. 192-93.